Note: You can also read the newsletter that we emailed from Nuku Hiva for a more immediate feel than the impressions below. Jon also put together some information for cruisers heading to the Marquesas. History: Most of the Marquesas have similar histories. Before contact with Europe, the Marquesan people were warlike and cannibalistic. Skilled warriors had high respect and authority. The people were led by hereditary chiefs, usually local to one part of an island. The people made artful wood carvings and tattooed their bodies. They also carefully preserved the heads and bodies of their ancestors. The Spaniards were the first to find the southern Marquesas in 1595, but did not reveal them for fear that the British would claim the islands. Marquesans were slaughtered by the Spanish, leading the southern Marquesan people to shun Europeans who arrived later, such as Captain Cook. 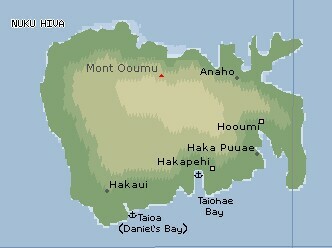 An American trading vessel found the northern islands, such as Nuku Hiva, almost 200 years later, in 1791. After that, the population fell from about 80,000 to 15,000 in 50 years. By 1926, there were only 2,000 people left, and even today the population is only around 8,000. Although France took possession of the islands in 1842, slavers and disease continued to decimate the natives. Despite the efforts of the Catholic missionaries to stop tattooing and cannibalism, around 95% of the Marquesan people died before the others were converted. Today, the Marquesas are the only part of French Polynesia with a predominance of Catholics. (Amanda) Taiohae Bay reminded me a bit of Dominica. A long anchorage, with a long town, towered by high, green hills. 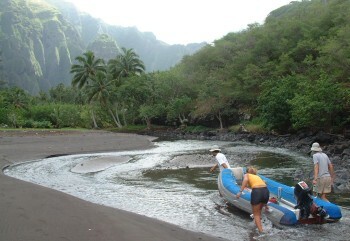 Taiohae had more boats than Dominica ever did, though, and the water was deeper. The town here was bigger than in Ua Pou, and slightly more modern-looking, with fancy hotels up the hills on the sides of the bay. One night when we were there, we heard some drums coming from shore, near the dinghy dock. Intrigued, we hopped in the dinghy and went to see what was happening. It was a dance group, girls in short pareas doing their hip-wiggling, and hot, sweaty, shirtless guys doing warlike hakas, all accompanied by five or six percussion instruments. Wow! Turns out they practice every night, so every night after that we went to watch, until we discovered another, more advanced group. These people were amazing! fast, intricate drumming, warlike dances from the guys, graceful dances from the girls, I was in awe. I wish we were still there, to watch them more. I don't think I'd ever see enough. But the falls, when we got to them, were beautiful. The water was freezing, but with a little swimming, then a bit of rock-scrambling, you could get into this nearly-enclosed pool. Standing on the side, you could see the circle of blue and green above you, feel the spray on your face, hear the roar of the waterfall echoing off all the smooth rocks. Very impressive. 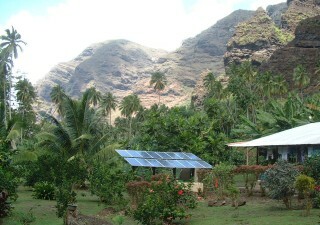 (Sue) Nuku Hiva is one of the more-visited islands of the Marquesas. There are daily flights from Tahiti and a few hotels, some with swimming pools. But the shops are reminiscent of those in small towns of the Eastern Caribbean -- airy, wooden structures, with shelves filled with only one or two brands of the most basic needs. Prices here are high (50 cents an egg), and the people friendly. 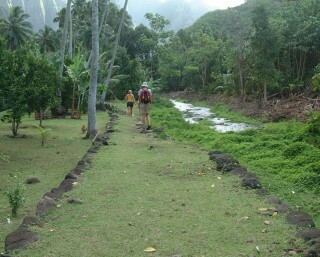 But they're definitely more on the tourist track, because we found no free fruit here, as we had on neighboring Ua Pou. Jon and I took an all-day hike up the mountains behind the town, following rugged 4-WD roads, and some foot/mule paths. We explored a restored ceremonial site and enjoyed fabulous views from the forest above the town. Our hiking took us past old fruit orchards where we could pick now-wild lemons and limes. The evening dances (free) were great, but we especially loved the wild drumming that accompanied the men's dances, or hakas. I loved the ancient feel of the hike in Daniel's Bay, along an old path called King's Way. 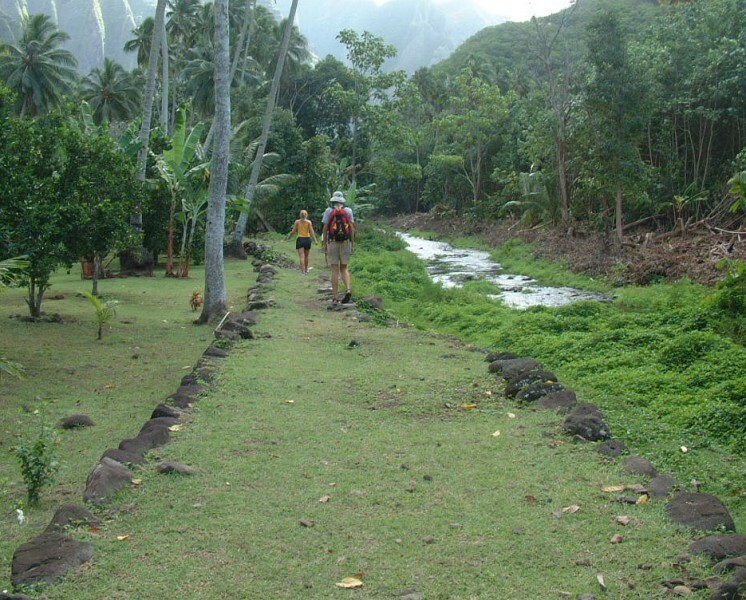 Though the waterfall and pool was less clear than those we'd seen in the Caribbean, the walk had a sense of history as we passed old ruins, and the remnants of orchards and ancient home-sites. (Jon) Reading the history of the Marquesas (indeed, all of French Polynesia) is a bit depressing. The missionaries (with, I suppose, the best of their intentions) decimated and almost eliminated much of this wonderful culture. Dancing, tattooing, and even singing were outlawed. Clothing had to be worn (there is almost no reason to do so here) and a new set of values were impressed. Before the missionaries came, the Polynesians had no concept of ownership - everything belonged to everyone, and everyone worked together for the good of the community. It has only been in the last 40 or so years that the value of the Marquesan culture has been appreciated and active attempts have been made to preserve and even resurrect what's left of it. But when much of the culture is based in song and dance that can only be passed on through the generations, and it's been outlawed for 60 years, I fear much was lost permanently. Another interesting observation from our walks: there were lots of old stone ruins all over the place. I would think archaeologists would have a field day with so much material to work with, but we didn't see anyone who was recognizably studying the area. Most of the ruins were old housing platforms - lots of stone blocks raised up sometimes 10 feet off the ground, with a smooth living surface on top. Apparently, the actual living structures were somewhat ephemeral relative to the platforms. 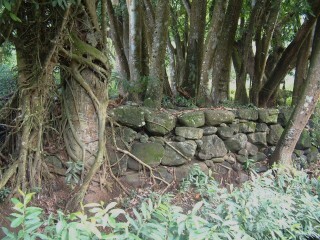 Even now, giant fig trees are slowly tearing these massive stone platforms apart. Some of these areas look like the set of an Indiana Jones movie. Walking through them, I half expected to see Indiana Jones (Harrison Ford) come leaping out of the mountain, pursued by some fanciful menace to life and limb. (Chris) The thing that struck me most about Nuku Hiva was its lush forest. The Marquesas have no coral reefs, and the water around the islands is muddy from runoff, so there is little to see while snorkeling. However, the islands themselves more than compensate. Everywhere that humans weren't using, and sometimes where they were, was covered in thick vegetation ranging from tall grasses and bushes to gigantic mango trees. 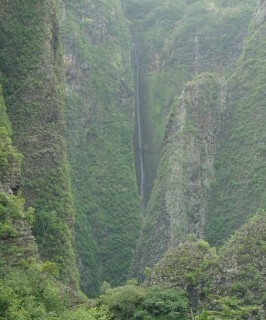 There was a fair bit of rain while we visited Nuku Hiva, and this is apparently normal. I don't know if the island gets enough rain to technically qualify as a rainforest, but much of it felt like one. 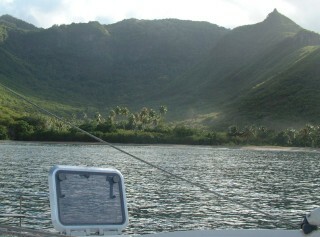 It was also very nice to be with all the people in Nuku Hiva, both locals and cruisers. There were a huge number of cruising boats in the anchorage at Taiohae Bay, and although there was nobody really my age, there were several other boats with kids on them. We all went ashore, kids and adults, to watch the dancing each night. During the day, we often did stuff either together with other cruising kids or ashore exploring the island. 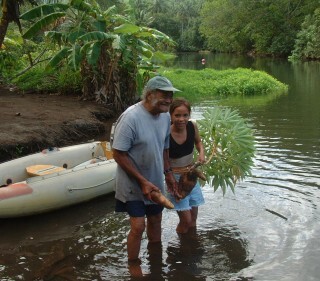 The locals were very friendly and the island was very safe for us.